Rumors have swirled about a possible live action Voltron movie for next year, but there's one piece of Voltron news that's solid. The cat-fisted giant robot is joining tabletop game Monsterpocalypse next year. The Voltron license is pretty brilliant. Instead of just one monster, you've got an iconic hero force and an assortment of genetically engineered robeasts . 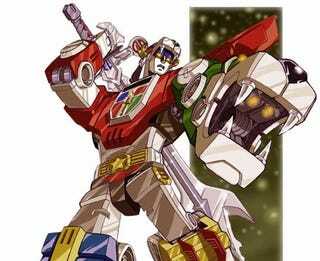 . . How will they tie the Voltron mythology into the Monsterpocalypse timeline? The current adventures of G.U.A.R.D. do not take place in "days of long ago." The Galaxy Alliance was based on Earth - maybe Alliance representatives will come to Earth and offer Voltron's help defending against "a new horrible menace." One also wonders if we'll just get the lion Voltron (which is specifically mentioned in the official press release), or if the vehicle Voltron will be along too. The Galaxy Alliance faction will need two robots, so I'm guessing both. I, for one, welcome our monstery overlords. Just thought I'd say that before everybody else.